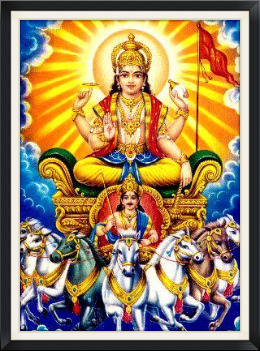 The Aditya Hrudhaya (Heart of the Sun) Stotram is an ode to the Sun God, Surya or Aditya, as was sung by Agastya Maharshi. This Stotram, as it occurs in the Ramayana, describes a time when Rama was fatigued with his long battle against the mighty Rakshasa, Ravana. At that time, the Rishi Agastya arrives on the scene and instructs Rama to recite the Aditya Hrudhaya Stotram to restore his morale and thereby defeat Ravana. Rama does so, chanting the Stotram thrice. He then fights Ravana with newfound vigor and strength. The Aditya Hrudhaya Stotram is often chanted thrice before an important event in which an individual's performance is tested. It is said to grant an individual the strength, courage, and perseverance to succeed in the given task. The Adity Hrudhaya Stotram is provided here (Sanskrit with English meanings).